A lovely lace square collar heirloom dress for portraits, weddings, flower girls, First Communion, confirmations, baptisms and holidays. The dress is made with batiste fabric and has a beautiful square collar trimmed in French lace. 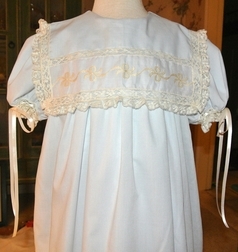 The lace is also across the collar with a Swiss emboidered bows insert in the center. The sleeves are embellished with lace and ribbon woven through entredeaux. The skirt of the dress is also decorated with the lace and Swiss insert just above a full, flowing ruffle. French lace completes the look as it trims the hem of the dress. DRESS WILL NOT BE MADE UNTIL AFTER EASTER WITH THE FIRST AVAILABLE RECEIPT DATE BEING MAY 5TH.